As we sit and enjoy Thanksgiving Dinner with family and friends today, there will be empty place settings at thousands of dinner tables across the country belonging to our men and women in the U.S. military who are deployed abroad or sitting alert to protect us here at home. 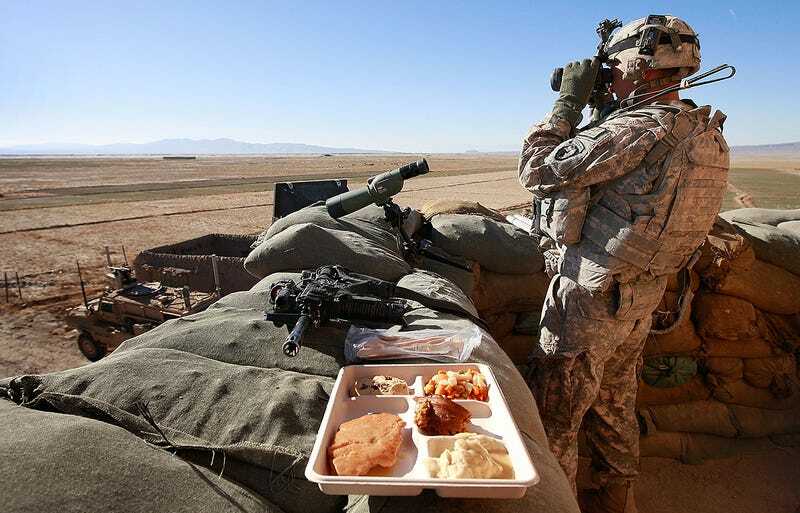 So the Pentagon tries to make those troops a little less homesick by providing them with a legitimate turkey dinner. This post originally appeared in November 2015 and is being republished today. This mission is accomplished every year by the Defense Logistics Agency. The U.S. has soldiers spread across hundreds of bases in more than 100 countries around the globe, not to mention many ships at sea. That’s a lot of turkey in a lot of places. Here’s the breakdown by the numbers, according to the Department of Defense. Although these numbers are bewildering, imagine how much larger they were at the height of the wars in Iraq and Afghanistan. The process for planning this Turkey Day offensive begins much earlier in May, when the DLA asks each service as to how many people they will need to feed and where. Then the agency has to figure out how much each location already has in the way of ingredients, so that shipping is maximized to just what they need. It can takes months for the refrigerated goods to reach some of America’s most remote bases, so each shipment has to be monitored as it travels in its refrigerated container on its way around the globe. Clearly, this is no easy task. They say wars are won by logistics. That may very well be true, but these logistics are about remembering those who make sacrifices so that we here at home can enjoy a peaceful meal with our loved ones.